I have a very versatile voice, from the guy next door to an over the top DJ, from the crazy villain to a caring Dad. I have a clear, crisp, enthusiastic and smiley type of read. French Canadian but also Neutral French for worldwide broadcast. 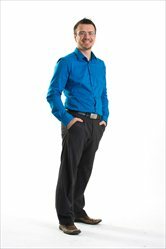 Eric is a male voice actor located in Gatineau, Canada. Words that describe my voice are French, Canadian, Voice.